Earlier, the UK jobs scene used to be more favourable for students from the EU. Not anymore. A group of 23 universities have already been granted permission to allow foreign students to stay for six months after graduation to find work. Delhi girl Rukmini Sanyal got part-time jobs while studying for her post-graduation from the London School of Economics. But soon after her graduation ceremony, she had to pack up and fly back to India. Sanyal was not able to find a graduatelevel job with a UK employer who was willing to sponsor her work permit. The four months’ time her visa gave her to stay back in the country after her course was not enough to land her suitable employment. Sanyal’s story is similar to those of thousands of Indian students who finish their graduate and postgraduate degrees in the UK. But now, Brexit had raised employment hopes of Indians going to study in the UK. Employers in the UK are wary of hiring foreign students or fresh graduates who need to be sponsored for Tier-2 work permits — which cover students from non-European Union (EU) countries. However, this rule is not applicable to students from the EU, giving them an advantage in the UK employment market. A White Paper released last month by the UK government had laid out a post-Brexit immigration plan focussed on the economy’s need for skilled migrants rather than the country of origin of the migrants. The new system, likely to be in place by 2021, would improve the prospects of Indian professionals and students. A huge advantage for international students would be the proposal to stay back for six months, instead of four now, after a course in the UK. “Since the proposals are scheduled to come into effect in 2021, there will be an immediate impact on Indian students considering pursuing higher education in the UK,” says Adarsh Khandelwal, cofounder and director of overseas educational consultant Collegify. The move to remove the cap on the number of visas for highly skilled workers, which was previously 20,700, is also seen as a positive factor for Indian students. “After Brexit, Indian professionals will be competing on merit rather than on nationality, as the UK will no longer have to favour EU nationals. The UK’s proposed skills-based immigration system improves the post-study work offering for international students,” says UKbased Sarosh Zaiwalla, founder of law firm Zaiwalla & Co LLP. But that dream job in the UK is not around the corner yet, say experts. Brexit might create a level-playing field for Indian students, but it will also generate economic headwind. “Most projections, at least for the short-medium term, show that Brexit will be a negative for the British economy. That will have a knock-on effect on the labour markets and on job prospects,” says Sanam Arora, a management professional in the UK and chairperson of the National Indian Students and Alumni Union. Arora and other Indian professionals in the UK also flag arbitrary conditions in the White Paper, such as a minimum £ 30,000 salary to count as a “high skilled” job. This may eliminate some opportunities for overseas professionals looking at healthcare and law. It is not clear when the proposals in the White Paper will be implemented. However, Indian students can be reassured they would not face a native disadvantage while competing with EU professionals for a job in the UK. “UK Must Restore 2-Year Post-Study Work Visa for International Students” Karan Bilimoria, British-Indian entrepreneur, member of UK parliament and founding chairman of the UK Council for International Students, has repeatedly raised the issue of the falling number of Indian students in the UK. In a conversation with Ishani Duttagupta, he talks about the likely impact of the White Paper on immigration. Will Indian students in the UK benefit from the measures proposed in the White Paper? 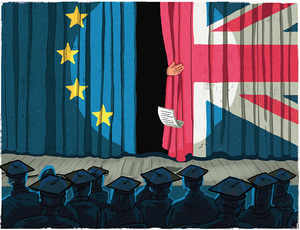 Brexit stands to inflict huge damage on the UK’s world-leading universities, which have gained a great deal from an open environment. Unless we take measures to make the UK and its universities more attractive, we will continue to lose out in the battle for students from India. The government’s White Paper on immigration provides no clear answers on how the UK will secure its supply of international academics and students and continue to provide the same level of teaching excellence. We must bring back the two-year post-study work visa for all international students so that they can work in the UK after they graduate. What is the likely time line to implement these proposals? We will not know for at least one year how different the new proposals are from current visa policy. The proposals are still a long way from being implemented. Is immigration a way to solving Brexit problems for the UK? The re-evaluation of Tier-2 visa rules and the recent lifting of the cap on overseas doctors and nurses – including those from India – coming to work in the UK is a strong sign that the government is slowly turning its attention to the hugely positive effects that immigration from countries like India has had on the UK. Yet this will only go some of the way to limiting the catastrophic effects of Brexit. Outside of the EU, the UK will lose its enormous economic advantage. Do you think any changes are likely in the short term? The proposals by the government still fall short of the November 2018 proposals outlined by an allparty parliamentary group for international students. The government must be clear on its commitment to increasing the numbers of international students in the UK and set out a clear strategy not only to encourage students to explore the option of staying on and working, but to drive up the numbers who study here in the first place.